This post continues our series of posts about music that serves a higher purpose. This music reaches beyond pure listening enjoyment, raising awareness about important issues that affects countless people in their day-to-day lives. Alastair Moock had built a successful career as a folk musician when cancer struck. It didn’t strike him, but rather his 6-year-old daughter who was diagnosed with leukemia. Moock responded with his guitar, bringing it to the hospital to help pass the time and alleviate the tension. 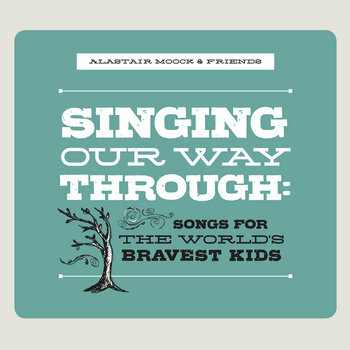 That effort quickly evolved into Singing Our Way Through: Songs for the World’s Bravest Kids. This wonderful new release is both a comfort to those facing similar battles and an inspiration to those who aren’t. Moock mines his folk roots with “Take Care of Your Grown-Ups,” counseling kids to look out for their elders. “Children take care of your grown-ups, even when you know that they’re wrong,” he sings, “they stress and they guess and they’re not that well dressed, but they’re trying so hard to be strong.” In the context of the topic, it is a gentle reminder that no one is immune to cancer — it affects us all. Not having kids of my own, I’m not overly familiar with Elizabeth Mitchell and the Okee Dokee Brothers, 2013 Grammy nominee and Grammy winner in the children’s music category. Nonetheless, their contributions to the folk ballad “Take a Little Walk with Me” and the Woody Guthrie country blues “Hard Travelin’,” respectively, are among my favorite tracks on the release. As good as this music is, its impact is even stronger. Since the album’s release in July 2013, it has been distributed to over 1,500 cancer patient families across the United States. Get more information on the Singing Our Way project here and more Music With a Purpose here.